S'Agaro is one of the best planned and luxurious spots on the Costa Brava. 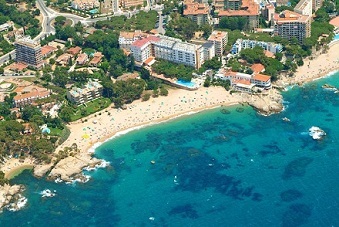 With a 700 meters long beach and other small ones, it presents a unique setting with sea, rocks, hills, olives, leafy gardens, immaculate lawns, avenues and squares. S'Agaro is also outstanding for the great collection of houses, mansions, hotels and other establishments all set in a spectacular landscape. Most of the great places are the creation of Jose Encesa, aided by the architects Maso, Forguera and Frorensa. On a lovely walk encircling the village above the sea' you can see eastwards as far as the delightful coves of Pedrosa del Pi, de Vaques and Sa Conca.